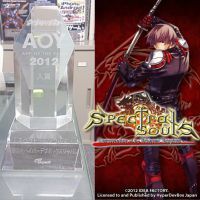 SpicySoft Corp. has Given the 2012 award for most interesting Android Game of 2012 to Spectral Souls. Here is a picture of the “App of the Year” 2012 award that we received. Thank you also to our fans (you guys ^_^ ) that helped us win this award. https://hyperdevbox.com/wp-content/uploads/2014/10/HDXlogo.png 150 150 hyperdevboxeditor http://hyperdevbox.com/wp-content/uploads/2014/10/HDXLogo_340x156.png hyperdevboxeditor2013-01-24 01:22:022014-10-28 23:36:54"App of the Year" 2012 award for Spectral Souls.